If you live and breathe music like my family does, you may be on the lookout for an incredible music-themed gift for the holidays. That's exactly what I was doing when I stumbled upon Recycled Album Art on Etsy. This shop literally stopped me in my tracks and took my breath away! Recycled Album Art re-purposes original vinyl album covers into coaster sets - sets of 9 to be exact. They have the most eclectic collection of bands, from rock to country to jazz to punk (and beyond)! I found the perfect gift for one of my musically inclined loved ones, at which point Recycled Album Art offered to do a giveaway for Haute Whimsy readers! Best of luck! Giveaway ends 12/12 at 11:59 PM and winner must choose their set by 12/15. *Congratulations to our winner, Leslie! I'm on the line between The Cars "Shake it Up" and Michael McDonald. The Cars are one of my all time favorite bands, but owning Michael McDonald coasters would be hilarious. Thank you so much for giving us the chance to win such a fun and unique prize! 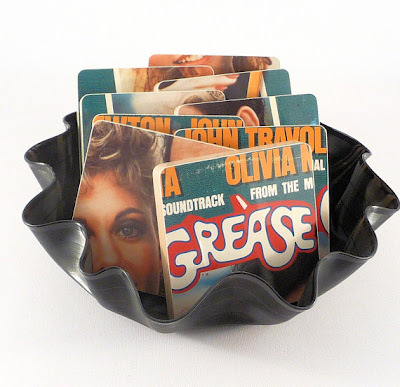 Ahhh, I need that Grease album coasters. I wore my cassette out when I was a kid. Oh cool, I would choose the GHOSTBUSTERS Movie Soundtrack set! so many to choose from. I like the The Eagles-hotel california. I fav your shop on etsy and liked on FB. i favorited the shop on etsy. 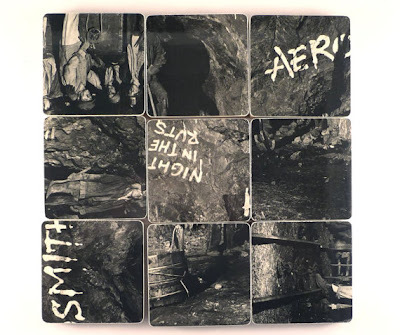 I love the Cyber Week Sale Coasters with basket from PINK FLOYD The Final Cut Record Album. Thanks for the chance to enter! Very cute. I'd pick the Elton John set. I "like" Haute Whimsy on Facebook via Cindy A.
I really love the Ray Charles 1958 album set! I would choose the 9 Record Album Coasters and Basket from LED ZEPPELIN IV record album for my friend that loves Led Zeppelin. I like the Prince coasters the best. I'd totally get the Handmade Holder and Coasters from MEAT LOAF! Those are awesome and my hubby would love them too! Christina - xristya@rock.com - I'd choose Simon And Garfunkel! Pink Floyd's Dark Side would be my choice. I would choose Led Zeppelin IV. I love would the Simon and Garfunkel greatest hits album! I love the Aladdin set!! i love the land before time set! I like the quiet roit one. Thanks for the chance to win. So many good ones...idk...maybe Simon & Garfunkel! I definitely would get the Reba McEntire coasters! favorite Recycled Album Art on Etsy---i did! I tweeted this giveaway too! Like Haute Whimsy on FB under the name Ashley Violet Ellis. I shared this giveaway on FB under the name Ashley Violet Ellis. I follow @McCoyCreations on Twitter. I hearted RecycledAlbumArt, user name gkran. hard to choose, but I like the Pink Floyd and Lynard Skynard. I love the Grease but have to choose Ghostbusters. I favorited the Ghostbusters set on Etsy. Follow Recycled Album Art on Twitter.